Who knew it could be fun to sketch at the hardware store? There were laughs (see end of post) and artistic discoveries galore at our Tuesday night sketchcrawl, now forced to go indoors for the winter. When I first arrived I started to ask one of the helpful employees that Pastime Hardware is famous for, about the part I needed for my toilet. Before he could show me where to find it, my phone rang with the ringtone I made from the Cake song “Never There” (click below to hear the ringtone). https://janabouc.files.wordpress.com/2009/11/03-never-there.mp3 An employee who was standing nearby said, “Hey! That’s Cake.” and then began whistling it. Throughout the evening I could hear him whistling the tune from all around the large store, which gratefully, is one of the few stores in existence that does not play annoying music 24/7 over the loudspeakers. I had no idea how many differently shaped toilet seats there are. I discovered that looking at the negative shapes between the seats helped me to better find the shape of each seat. Then, looking more deeply and trying not to generalize, I discoverd the piles of boxed and/or wrapped toilet seats on the shelves behind the display. And then I noticed and added the pegboard behind that. I fell in love with the pretty color I mixed from cerulean blue and yellow ochre for the pegboard. This, to me, is the joy of sketching in a nutshell: seeing more and more deeply and the fun of making lines and dots and shapes and playing with color. 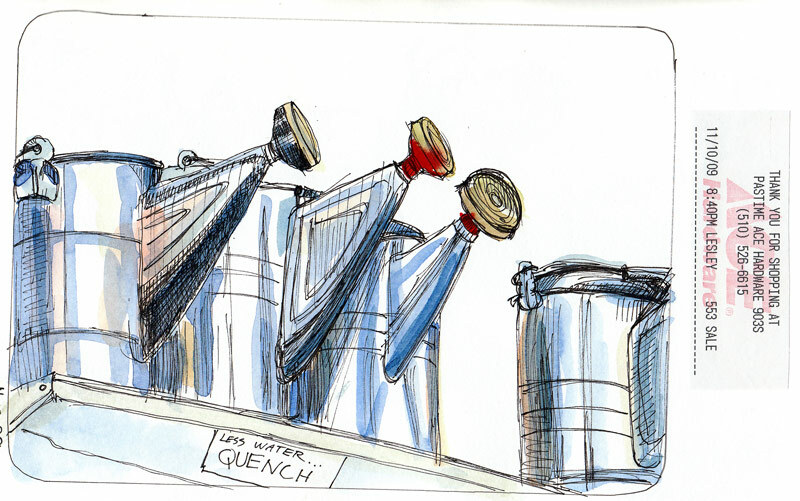 Next I faced the opposite direction and drew and painted these large metal watering cans up on a tall shelf. When I got home I glued a bit of my receipt (from the toilet flapper I bought) to the edge of the page in my sketchbook (above). Tonight I thought the page might look better with a dark background so I added some ink, didn’t like that, and then painted with gouache over the ink to get more what I had in mind. (The receipt is still there, I just didn’t scan that part below). The last sketch I did was of Cathy sketching a row of hand trucks in the room filled with bins of nails. I messed up her face but fixed the FAIL by pasting another piece of receipt over her head. …and then laughter ensued throughout the store, employees, customers and us artists alike! It was a slow night at Pastime, with twice the employees as customers, so I’d like to think they enjoyed our company as much as we enjoyed theirs. This story is so funny. What a great idea – invade a shop and paint whatever is about. Certainly the workers there must have had some laughs. I thoroughly enjoyed reading this post – what fun! I’m going to have to try out your excellent idea. Your drawings are really good too! Thank you for the morning smile, Jana! How lovely to have had an enjoyable and fun evening of sketching, but to have also shared that with others. Loved this. You have so much fun. My mother who is 86 does this with a friend in Jackson. They usually sit in a restaurant and draw the people. I will have to suggest she go to a hardware store – although sadly there probably isn’t one in Jackson now because Lowe’s moved in. Another whimsical super composition good job once again! No doubt, i wish I could have joined you. love al of these, Jana, especially the loo seats. Great story and sketches, Jana. 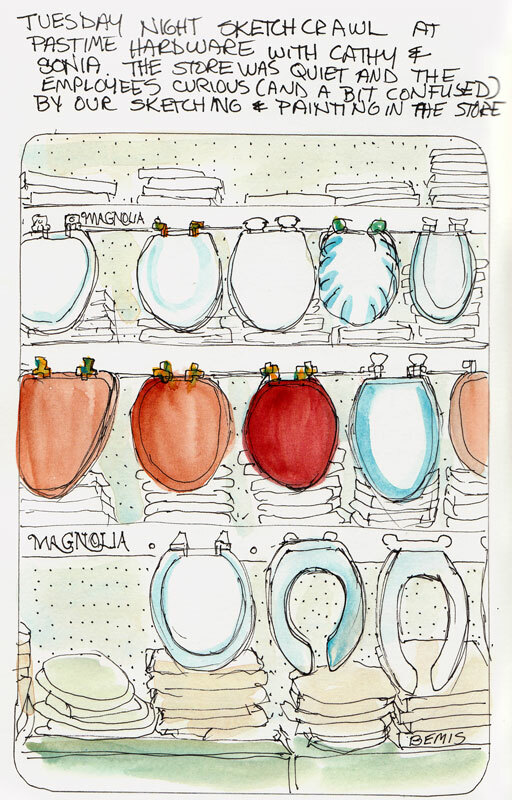 The part about drawing toilet seats reminded me that you never know where you’ll be when enlightenment strikes. 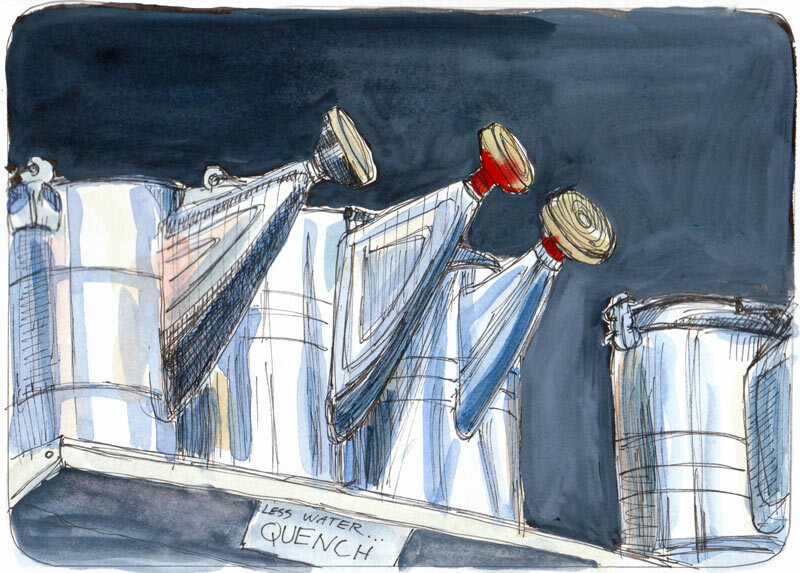 LOVED your sketchcrawl at the hardware store – great drawings and a fun posting! I wonder if I could get my art buddies to visit one? Now that’s an idea! Sounds like it was a lot of fun for EVERYONE! Hi Jana, You’re sketch crawl experiences are both funny and inspiring! Love the drawings too!